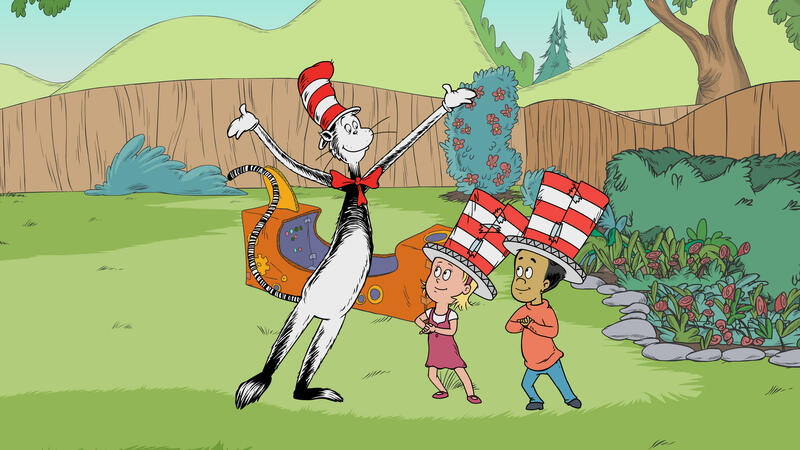 Mark Dr. Seuss's Birthday with a Week-long Cat-Ebration! A new one-hour show of The Cat in the Hat Knows a Lot About That! debuts on WV PBS Monday, March 3 at 3 p.m.
Credit Courtesy of Series copyright 2010, CITH Productions, Inc. and Red Hat Animation, Limited. Underlying characters copyright 1957, 1985 Dr. Seuss Enterprises, L.P.
A special week of science-focused The Cat in the Hat Knows A Lot About That! kicks off with a new one-hour special on WV PBS, Monday March 3 at 3 p.m.
New half-hour episodes also premiere on Tuesday, March 4, and Wednesday, March 5. 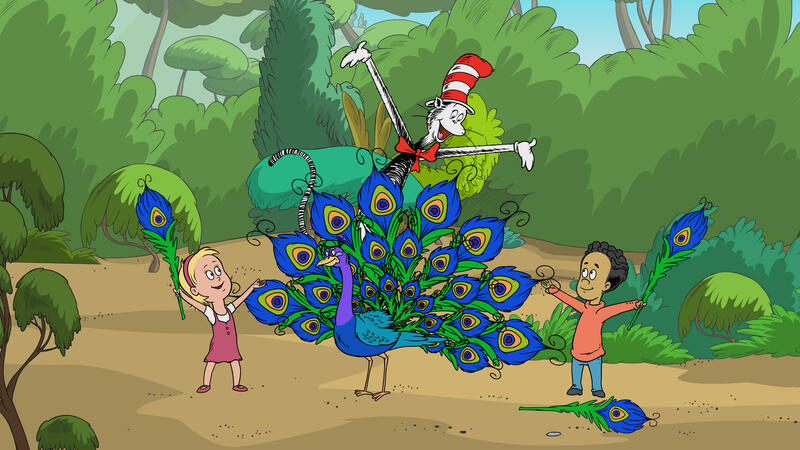 The new episodes follow the Cat, Nick and Sally as they explore a variety of animal attributes: from the benefits of crickets’ chirps and birds’ feathers, to the mimic octopus’ remarkable ability to imitate other sea creatures. Viewers also learn how glass is made, how multi-legged creatures walk and how cotton is spun into fabric. 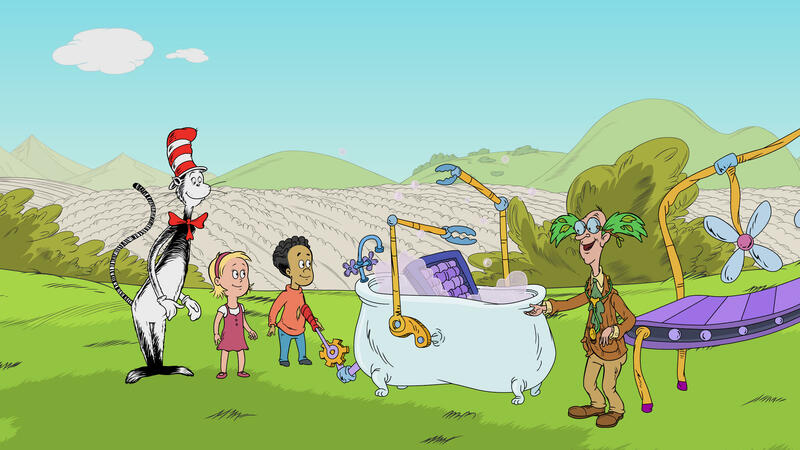 As part of “Cat-ebration Week,” there’s also a new, mobile-friendly The Cat In The Hat Knows A Lot About That! game: “Marbleous Marvel Coaster.” Available at pbskids.org/catinthehat, “Marbleous Marvel Coaster” allows kids to create their own Seussian rollercoasters using open-ended play and engineering skills. Monday, March 3 at 3 p.m. -- “Step This Way”: The kids are playing dress-up, with Sally wearing her mom’s shoes and Nick wearing his dad’s shoes. They're having trouble walking, and the Cat thinks it’s because their feet are the wrong shape. But doesn’t everyone have the same shaped feet? Not at all! The Cat takes them to the Jungle of Bingle-Bungle Boo to meet his friends Emily the Teal, Mikey the Lemur and Greg the Gecko. They see that animals have differently shaped feet to help them do different things! You need the right feet for the right job! 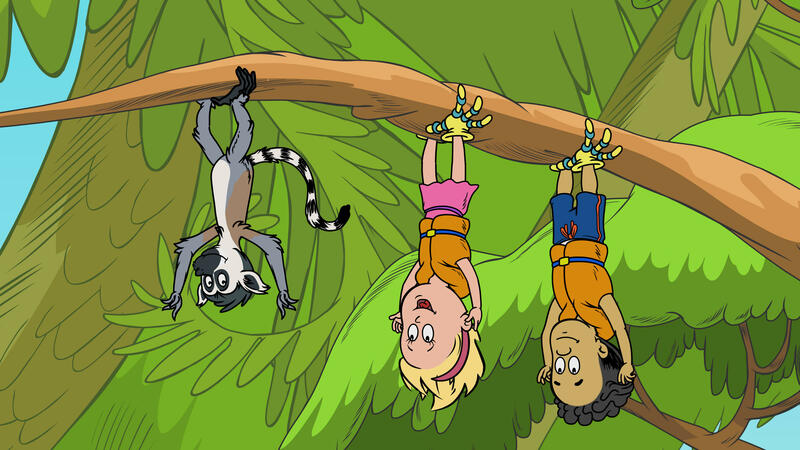 Tuesday, March 4 at 3:30 p.m. -- “Balancing Act”: Sally and Nick are trying to walk across a beam in their backyard, but are having trouble staying on it! Can the Cat help? Why of course! His friend Zappa the Snow Leopard is an amazing balancer! He uses his big wide feet and his long tail to help him keep his balance. Nick and Sally don't have tails, but they see how Zappa moves carefully to keep his weight balanced. Now they know what to do at home. Using broomsticks to help them stay balanced, Nick and Sally are able to cross the balance beam. And just in time to have some yummy bran berry muffins! Wednesday, March 5 at 3:30 p.m. -- “Take a Walk”: Sally and Nick are practicing to be in a three-legged race, but walking on three legs is hard! Well, if anyone knows about walking, its Cat’s friends Sid the Centipede, Spinny the Spider and Bugsy the Beetle! They all teach the kids how they walk on many legs by keeping a steady pace and walking in a rhythm and a beat. Back at home, Nick and Sally practice what they learned by using their own special rhythm! About The Cat In The Hat Knows A Lot About That! The Cat In The Hat Knows A Lot About That! was created in response to recent findings that children graduating from kindergarten are less prepared to learn about science than about other subjects. The series supports young children’s science learning by introducing scientific inquiry skills, teaching core science concepts and vocabulary, and preparing preschoolers for kindergarten and first grade science curriculum — all in whimsical style. A team of science and early childhood experts developed the curriculum for the series, each episode of which begins with a question posed by Sally or Nick. Although the Cat in the Hat knows a lot of things, his insatiable curiosity to learn more about the world leads to adventures with Sally and Nick in his one-of-a-kind Thinga-ma-jigger, a marvelously Seuss-ian contraption that sprouts wings, pontoons, booster rockets, skis and just about anything else needed to find the answer. 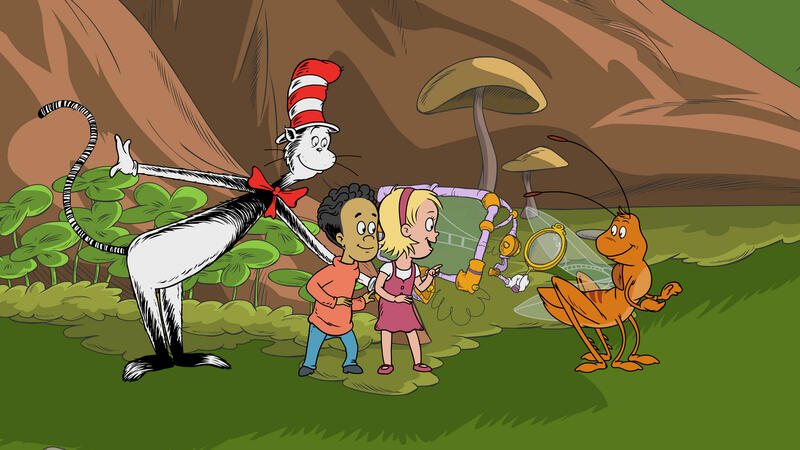 The inquisitive gang travels to the bottom of the sea to observe giant sea worms, zips to the rain forest to visit animals living in kapok trees and shrinks to bee-size to visit a hive and learn how honey is made. 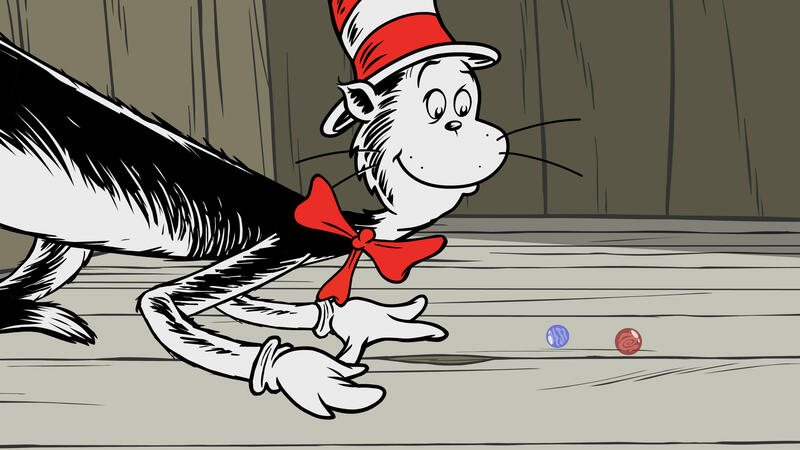 Guided by the Cat in the Hat, the kids figure things out by observing, collecting and managing clues, making connections, constructing and evaluating theories and having discussions – all in a preschool-appropriate manner. The Cat In The Hat Knows A Lot About That! is a Portfolio Entertainment/Collingwood O’Hare Production, A Canada UK Co-Production produced with PBS (USA), Treehouse (Canada), in association with Dr. Seuss Enterprises and Random House Children’s Entertainment and with the financial participation of the Canadian Media Fund, the Shaw Rocket Fund and the Government of Canada. The series is distributed by Portfolio International.